CAPE CANAVERAL — Poised for its one and only satellite launch of the year, the National Reconnaissance Office will conduct a hush-hush flight Thursday, Oct. 8 using a United Launch Alliance Atlas 5 rocket from California. Liftoff from Space Launch Complex 3-East at Vandenberg Air Force Base is targeted for 5:49 a.m. local (8:49 a.m. EDT; 1249 GMT). The length of the actual launch opportunity was not released. Officials previously disclosed that launch would be possible some time between 4:45 and 6:30 a.m. local time (7:45-9:30 a.m. EDT; 1145-1330 GMT). Weather forecasters predict a 70 percent chance of acceptable conditions. The National Reconnaissance Office is the secretive government agency responsible for the country’s fleet of spy satellites. This launch is known as NROL-55. The flight comes just six days after the most recent Atlas launch from Cape Canaveral and will be the second of three flights planned this month. The Mexican Morelos 3 telecommunications satellite was launched Oct. 2 and the Air Force’s Global Positioning System 2F-11 navigation spacecraft is scheduled for flight on Oct. 30. 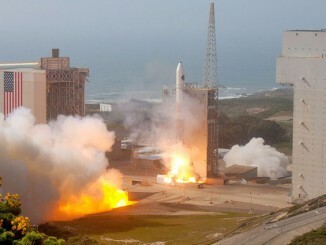 What’s more, United Launch Alliance marked its 100th successful flight with the Morelos 3 mission last week. “I’m so proud of my guys, oh my gosh. One hundred launches in a row. It is an unprecedented record, It is a tribute to the fleet of rockets and hard work of our people that think about mission success,” said Tory Bruno, the president and CEO of United Launch Alliance. Thursday’s launch is expected to follow a “coast-hugger” trajectory to the south as the rocket likely hauls two formation-flying naval reconnaissance satellites into a 700-mile-high orbit tilted 63 degrees to the equator. Satellite-tracking hobbyists believe the mission will carry a satellite pair for the NRO, just like two previous Atlas 5s from Vandenberg, to further refresh the orbiting network commonly referred to as the Naval Ocean Surveillance System, or NOSS. “NOSS satellites track ships at sea through their radio transmissions,” said Ted Molczan, a respected monitor of spacecraft. “The first two generations, launched between 1976 and 1996, consisted of triplets that orbited in close formation. Analysis of the difference in time of arrival of a signal at each member of a triplet enabled determination of the location of the source. This launch is expected to be the seventh for the current breed of NOSS featuring satellite duos instead of the previous triplet arrangement. It is unofficially dubbed NOSS 3-7. Atlas rockets have deployed this generation beginning with two missions from Vandenberg that went up in 2001 and 2003 aboard Atlas 2AS vehicles, then two flights from Cape Canaveral that flew on the Atlas 3B in 2005 and an Atlas 5 in 2007, and two Vandenberg missions using Atlas 5s in 2011 and 2012. It is suspected that the latest duo will replace the aging NOSS 3-3 satellites launched into the constellation a decade ago aboard the Atlas 3B rocket. “I believe that the nominal spacecraft life is 8-10 years, limited in part by orbital perturbations,” Molczan said. Two older NOSS pairs — NOSS 3-1 and 3-2 — were replaced by the 2011 and 2012 launches and broke apart from their formations 7-8 months after successful launches of the successors, Molczan noted. Also hitching a ride to orbit with NOSS will be 13 tiny technology Cubesats — 9 sponsored by the NRO and 4 sponsored by NASA — as part of the Government Rideshare Advanced Concepts Experiment, or GRACE. *AeroCube-5c and AeroCube-7 — technology pathfinders from Aerospace Corp. that weigh 1.5 kilograms each and will demonstrate tracking technologies, optical communications and laser communication. *SNaP-3 — A total of three CubeSats, weighing 4.5 kilogram each, from the Army’s Space and Missile Defense Center, whose mission is to develop user software-defined radios to provide beyond-line-of-sight communication for disadvantaged users in remote locations. *PropCube — Two 1-kilogram CubeSat from Tyvak performing dual frequency ionospheric calibration measurements. *SINOD-D — Two 2-kilogram CubeSats from SRI International demonstrating software defined radio communications. *ARC-1 (Alaska Research CubeSat 1) — 1-kilogram CubeSat developed by the University of Alaska-Fairbanks whose mission is to measure thermal and vibration environment during launch, and increase the Technology Readiness Level on both their attitude control and determination system, as well as, the high bandwidth communication system. *BisonSat — 1-kilogram CubeSat from Salish Kootenai College whose mission is to train students on the design, construction, test, and operation of space hardware by using a specially designed light camera to calculate and test land cover classification, cloud cover, and cloud height measurements. *AMSAT Fox-1 — 1-kilogram CubeSat features an amateur radio FM voice repeater that will provide easy portable satellite communications opportunities for amateur radio operators worldwide. The satellite will also test a MEMS Gyro and a low energy proton experiment. *LMRST-Sat (Low Mass Radio Science Transponder – Satellite) — 3-kilogram CubeSat from the Jet Propulsion Laboratory which will demonstrate the Low Mass Radio Transponder in earth orbit to raise its Technology Readiness Level. The Atlas 5 rocket has flown 57 times since debuting in 2002 and performed 11 launches for the National Reconnaissance Office since 2007. 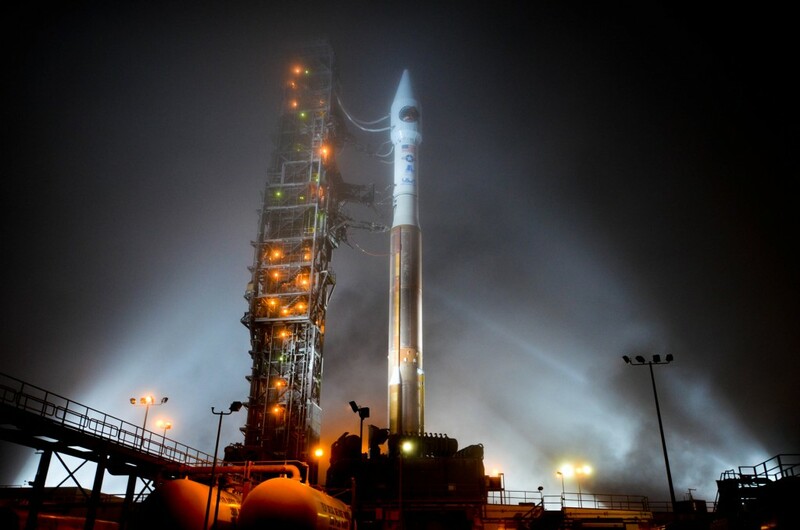 It is ULA’s 101st launch and 20th for the NRO. 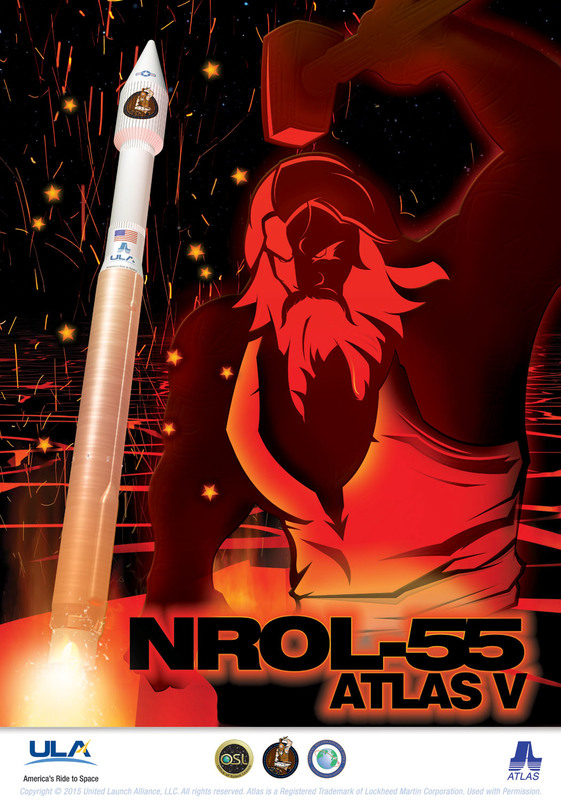 For the NROL-55 mission, the rocket is operating for the 28th time in its basic 401 configuration with the kerosene-fueled main stage for 860,000 pounds of thrust at liftoff and the hydrogen-fed, single-engine Centaur upper stage to shape the satellites’ orbit. 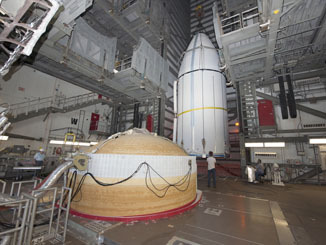 The payload is encapsulated in a 14-foot-diameter nose cone for atmospheric ascent. 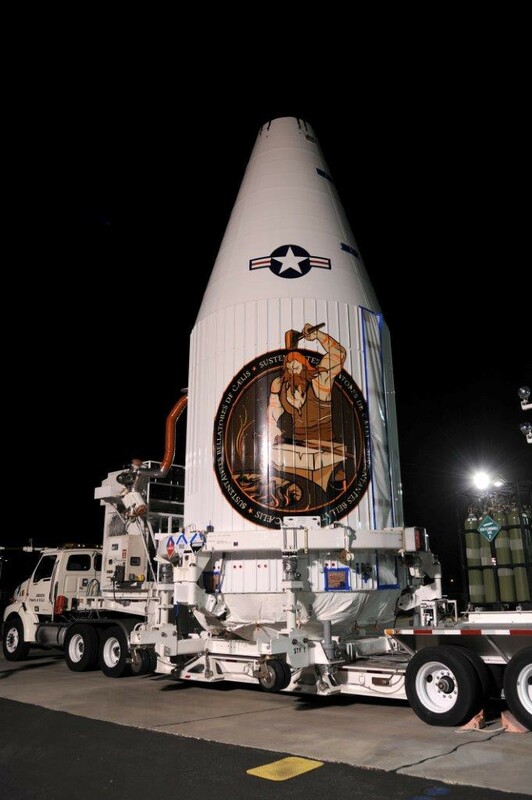 The launch countdown begins about eight hours before liftoff. Rollback of the mobile service gantry at Space Launch Complex 3-East occurs five hours prior to flight, followed by the start of fueling with two hours to go.